Captivating read that blends forbidden romance with a tale of friendship, family and forgiveness. It was a year she would never forget even if she wanted to. Life for Hadley has so far been uneventful, with no great love affairs, no searing losses. But then she decides to spend a year studying in the glittering Swiss city of Lausanne, a place that feels alive with promise. It’s here that she has a passionate romance with a man who’s out of bounds, and meets Kristina, forming the strangest of friendships. Yet, one night, tragedy strikes unexpectedly and what was supposed to be a carefree adventure becomes a darker journey of self-discovery. A Heart Bent Out of Shape was definitely a deviation for me when it comes to my reading habits. Usually, I stick to the YA genre, but once in a while I like to dip in to the Adult genre for a change. 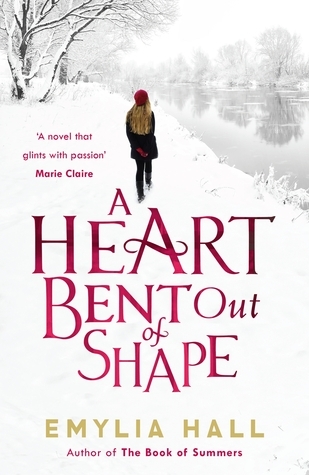 This time, I chose to read A Heart Bent Out of Shape, which happens to be the first book I’ve been sent through Bookbridgr (which is awesome, by the way). I’ve never read Emylia’s acclaimed debut novel, The Book of Summers, but I thought that the blurb for A Heart Bent Out of Shape (which was published in America as The Swiss Affair) sounded intriguing, so decided to give it a shot and I’m really pleased that I did. It was easy for me to immediately relate with Hadley, the main character in this book, because she’s just 20 years old and is a literature-loving uni student. I’m 23 and have already graduated but it wasn’t so long ago that I found myself in the same stage of life that she’s in. The beginning of this novel is quite light-hearted, following Hadley as she nervously embarks on an adventure to Switzerland and meets new friends. But just by reading the blurb, I knew that the reading experience would soon change when a devastating accident occurs and makes living in Switzerland difficult for Hadley. I won’t tell you what happens, of course. You’ll have to find that one out for yourself. From that moment onwards, the feel of the novel is sombre, with just little moments of happiness soon dismissed by waves of guilt and heartache. The romance is confusing. While powerful, Hadley’s love often falters and there’s always a sense of doubt. This is in part because the romance is a forbidden one (let’s face it, we all enjoy a bit of forbidden romance in a novel), but also because there’s never complete trust in their relationship. I think I would have liked to have believed in the relationship more. I was never completely sure about it, and perhaps the reader isn’t supposed to be. But a stronger bond would have made the twists much more impactful and heartbreaking, though they did manage to be unexpected. I did love the bond between Hugo, who became one of my favourite characters by the end, and Hadley. It’s unexpected and unusual, but true and heartwarming, a nice change from the fragile relationships dotted throughout the rest of the novel. The ending left me a little disappointed, though. I felt like I wanted something more to give me that satisfying feeling that I love when I read the last page of a good novel, but it left things quite open and I know there won’t be a sequel. Maybe I’m just being greedy. Overall, I really liked A Heart Bent Out of Shape. I can’t exactly say that I enjoyed it because it’s quite an upsetting and disheartening read at times, but Emliya’s writing style is beautiful, and I’ll definitely be reading her debut novel at some point in the near future. You might like A Heart Bent Out of Shape if you enjoyed one of the following. Alternatively, if you’ve read A Heart Bent Out of Shape and enjoyed it, here are some recommendations for your TBR list.